There were no entertainments at Tsarskoe Selo during the war. A few private cinema exhibitions only were given, of special military films, and on these occasions the Household and sometimes a few guests were invited. Once Sit George Buchanan was asked to see an English war film; another time M. Paleologue was invited to see a French one. No ladies were asked, except the Household, as the Empress felt too tired to entertain them ; and the men she could leave to the Emperor. In the Emperor's absence, she scarcely ever invited anyone to lunch or dine with her. The Empress profited by meal-times to rest and write letters. The young Grand Duchesses' table was close to her couch. Meals to her Were an unimportant matter. She ate very sparingly, and had been practically a vegetarian for years. She, of course, fasted all through Lent, as prescribed by the Orthodox Church. Only once did the Empress give an official luncheon in the Emperor's absence. It was on the occasion of the arrival of the Japanese Prince Kanin in September 1916. She was very nervous, but as the Prince came specially to Tsarskoe Selo to see her, after having been to Mohileff, and to Kiev to see the Dowager-Empress, she felt it to be her duty, and was as proud as a girl when her lunch proved to be a success. The Emperor was almost uninterruptedly at Mohileff during the summer and early autumn of 1916. He came back for short spells, both in October and November. During this second stay a slight stir was caused at Court by the visit of the Crown Prince Carol of Rumania - his second visit to Russia. This was the last time a State dinner was given. It was marked by the first official appearance of the Grand Duchess Marie, the Emperor's third daughter. She looked extremely pretty in her pale blue dress, wearing the diamonds that her parents gave to each of their daughters on her sixteenth birthday. Poor child! she felt that the world was coming to an end and that she was disgraced in its eyes for ever, when she slipped in her new high-heeled shoes and fell down as she was entering the dining-hall, on the arm of a tall Grand Duke. On hearing the noise, the Emperor remarked jokingly, "Of course, fat Marie." In November 1916 the state of tension in all circles had increased so greatly that it was evident that a serious crisis was imminent. Only the Emperor and Empress did not realise the full gravity of the situation. They believed that alarming reports were spread in order to force on reforms which the Emperor considered inopportune in time of war. He had listened to the voice of public opinion, and had dismissed the unpopular Prime Minister, Sturmer. It was said that the Dowager-Empress had urged this, when the Emperor had seen her at Kiev in November. But Protopopov still remained at the head of the Ministry of the Interior. He had succeeded in gaining their Majesties' confidence, and said reassuringly that he had the situation in hand. He had convinced the Empress of his absolute devotion to the, Crown. He had been in the elective service in the Provinces for many years, before being in the Duma, which had elected him to the post of Vice President. This, coupled with his well-known Conservative views, made the Emperor trust his knowledge of the country, and think that the action against him was the result of a cabal, trying at all costs to enforce changes. Protopopov had known Rasputin for a long time, and so it was said that his whole policy was influenced by the Staretz. Wild stories even were current that, after Rasputin's death, the Empress had seances with Protopopov, at which his ghost was called up. This was pure invention, as the Empress had never practiced spiritism: indeed, she often said to me that she considered it wrong to call up "the spirits of the dead, even if this were possible." Gradually the hostility towards the Empress, based on the political role she was supposed to play and on the totally unfounded report of her pro-German tendencies, crept from the couloirs of the Duma to the tribune of the assembly itself. The deputy Purishkevitch made a speech against the "Dark Powers " which, though ostensibly directed against Rasputin, was really a scarcely-veiled attack upon the Empress. Millukov followed, quoting a German paper which said that the Empress influenced Russia's politics. Millukov was a bitter enemy of the Emperor and the Empress, and spoke strongly, referring to German spies and making insinuations against the Court officials. Left: Alexandra and Nicholas in 1917. People who heard the debate realised that animosity was spreading from the Empress to the whole Imperial regime. The instigators of the Revolution of March 1917 were indefatigable in encouraging opposition to the Government. The Bolsheviks for their part were independently pursuing their deadly propaganda against the State. The upper classes, particularly those of Petrograd, had always criticized the Empress. They thought she had ignored them after 1905, during those years which had left her a semi-invalid. They had wanted to be amused, and the Empress had not entertained, as she considered the times were too serious. Her charities and her devotion to her children were ridiculed; her shyness in her rare public appearances was resented as aloofness. The wildest tales were spread; the name of Rasputin was in every mouth; and every story was implicitly believed by the middle and lower classes, who did not know the utter impossibility of the gossip they repeated. The Imperial Family did not support its head. There was a good deal of personal animosity against the Empress. She was rigid in her ideas, and had more than once expressed her disapproval of youthful follies and other actions which she had quite justly considered wrong. Sturmer had been succeeded as Prime Minister by Trepov, whose Government met with little support; the more reasonable elements stood aside. Trepov was soon succeeded by Prince Nicholas Galitzin, a senator, and formerly a provincial governor. Neither of these was the strong man that the situation demanded. The ship of state was drifting towards disaster. Rodzianko in his memoirs speaks of a tentative offer made to him to accept the Premiership. He says that one of his conditions was that the Empress should go to Livadia for the remainder of the war, which was clearly an impossible suggestion for the Emperor even to discuss. Warning voices began at last to reach the Emperor. Unfortunately, most of the people who tried to speak to him of the danger of the situation coupled their warnings with *attacks on the Empress, and the Emperor knew better than anyone the injustice of the charges against her. Both as sovereign and as husband he had to refuse to discuss the subject any further. Other people seemed to the Emperor to be speaking from personal motives, and he was not convinced that their advice was disinterested. The tone of some of the letters annoyed him. A revolutionary blast was in the air. A letter of this kind was written to the Empress by a well-known lady in society. By accident or design the writer of this managed to hurt the Empress deeply. The letter was meant as an "eye opener," but was full of bitterness. It was written, evidently in haste, on small sheets of paper torn from a note block, though perhaps the writer did not realise how wounding she was alike in tone and in manner. The Emperor was prepared to ignore letters to himself, but this to the Empress exhausted his patience, and he was advised to make an example in order to prevent the repetition of such epistles. The lady in question was asked by Count Freedericsz to retire to her country seat for a time. It was, perhaps, an injudicious measure, as it made a martyr of the lady, and people flocked to her house in sympathy. A few of the older leaders of society expressed their disapproval of her action, but the whole incident only created bitter feeling on all sides. Several members of the Imperial Family also warned the sovereigns of the increasing disaffection in the country. Among them was the Grand Duke Nicholas Mikhailovich, a well-known historian and a cousin of the Emperor. He was murdered by the Bolsheviks in Petrograd in 1919. The Emperor had received earlier letters from the Grand Duke, drawing attention to the "dangers " of intrigue. He knew his cousin's Liberal tendencies, and that he openly criticized the Government, the Empress and himself, and he had little faith in his advice, astute though he knew him to be. He had disregarded the former letters. He disregarded this one also. But later, when the Grand Duke spoke violently against the Empress in the clubs, he was asked to retire to his country estates. At about the same time the Grand Duchess Victoria Feodorovna spoke to the Empress of the unpopularity of the Government. The Grand Duchess was restrained in her language, and the Empress did not believe that her cousin's apprehensions were well founded. She always thought that she and the Emperor must know the situation better than anyone ; she had the assurance, backed with the authority of the Minister of the Interior, that it was only the desire to frighten the Emperor into granting hasty reforms that caused the spread of these rumours. And did not the letters from the provinces prove that Protopopov was right? At last the Grand Duchess Serge came from Moscow. Even this saintly woman was now reviled and slandered by the seditious elements. She was frightened at the hostility displayed towards her sister, and implored her to send Rasputin to his home in Siberia, pointing out that his presence in Petrograd gave credibility to the report that he was influencing the Cabinet, the Empress, and even the politics of the country. But the Empress was obdurate. She would not believe in coming disaster. She kept her blind faith in the millions of Russia's peasant population. 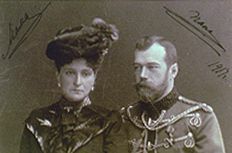 They would understand her faith in the Staretz, whose bodily presence seemed to her necessary to save the Tsarevich; to send him away when the child was continually liable to accidents or illness was impossible. Her son's life was at stake, as she thought, and her sister spoke to her in vain. The British Ambassador, Sir George Buchanan, was among those who at the last hour tried to open the Emperor's eyes and persuade him to avert disaster by granting constitutional reforms. Unfortunately, the British Ambassador had during the last year lost much of the Emperor's confidence. The Emperor had been told that Sir George was in touch with Millukov, Gutchkov, and others of the most advanced Liberal group, personal enemies to the Emperor, whom Sir George, as he says in his memoirs, considered simply as members of the Opposition, in the British Parliamentary sense. They proved later to be those in power after the Revolution of 1917. For this reason the Emperor no longer considered Sir George's opinions impartial, and the friendliness with which both the Emperor and the Empress had always met the British Ambassador, whom they had known as Minister in Darmstadt, had been replaced by more official relations. On January 12, 1917, Sir George sought audience of the Emperor, whom he says he had personally always liked, to offer him advice on the government of the country. He says himself that he acted thus against all diplomatic precedent and that he felt like a man trying to save a friend whom he sees falling over a precipice. All the arguments Sr. George used had no doubt been heard by the Emperor many times. They might, however, have carried more weight than those of opposing Ministers, if the Emperor had not believed that Sr. George got much of his information from the Opposition in the Duma. The British Ambassador also made the grave mistake of speaking about the supposed political influence of the Empress. These allusions to the Empress wrecked all chances of his advice being accepted, and the Emperor dismissed the Ambassador coldly. I heard from the most authentic sources that, if it had not been for the inadvisability of making changes in the Allied representation during the war, the Emperor would have written personally to His Majesty King George, demanding Sir George Buchanan's recall. After this interview the Emperor saw the British Ambassador on official occasions only, and all their subsequent conversations were purely formal. Website © Bob Atchison 1997, 1998, 1999 | Comments on the website | Search all Alexander Palace sites by Keywords | Website built by Pallasart Web Design.